Take a stroll to your local delicatessen...by walking into your kitchen! 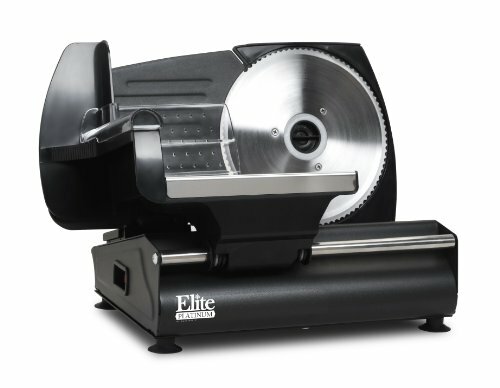 The Elite Platinum Classic Electric Food Slicer slices perfect, consistent deli-thin cold cuts, crisp vegetables or artisanal cheeses. The die cast aluminum housing has a removable and retractable 7.5-inch stainless steel blade with adjustable thickness from razor thin slices up to 1/2-inch slices. The large slicing platform features rubber feet for stability, On/Off switch, and easy to clean design. Its large slicing platform allows you to slice a wide variety of foods to construct the perfect sandwich or prepare a luxurious spread of appetizers and antipasti.